Our licensed electronic resources (including journals, ebooks, and databases) are restricted to UC San Diego faculty, staff and students. When you're off campus, you need to use VPN authentication to "identify" yourself as a member of one of these UC San Diego user groups when accessing these resources. VPN requires a one-time installation of the client, then you just login when you need to access the e-resources from off campus. Step 1. 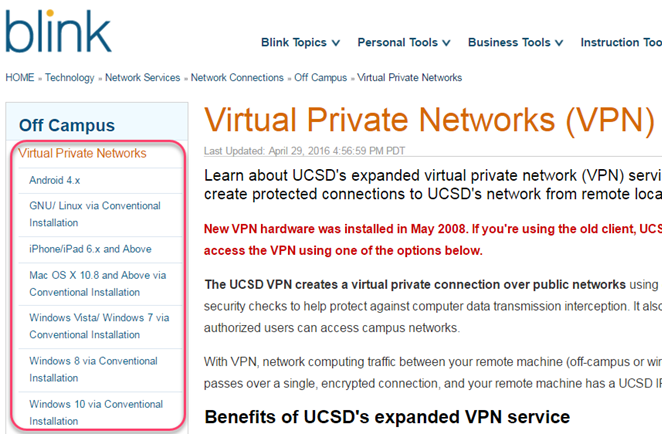 Go to blink.ucsd.edu/go/vpn and select your operating system. There are options for Android and iOS mobile devices as well. Step 2. Follow the instructions to download the client (or app or certificate) for your computer or mobile device's operating system. Click Expand All to see all of the steps at once. Step 3. 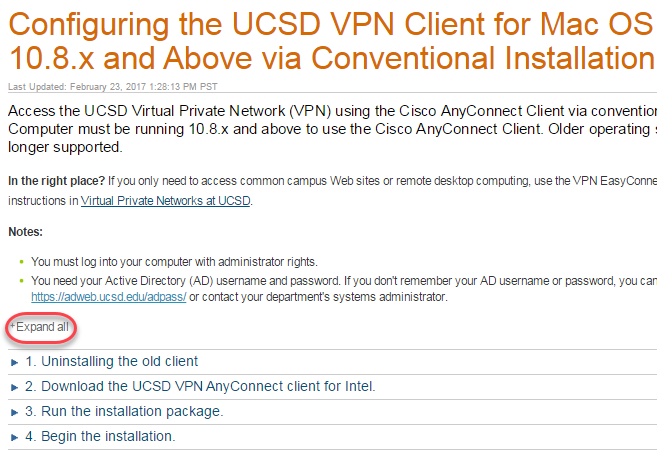 For Windows, OSX and Linux, open the installed client, and when prompted enter vpn.ucsd.edu to connect. Step 4. Login with your Active Directory (email) username and password. Select althruucsd from the Group drop-down menu. Once connected, you'll see a yellow lock over the AnyConnect Icon on your computer. When you're done with VPN, you can quit from the client, or disconnect when you close or log off your computer.